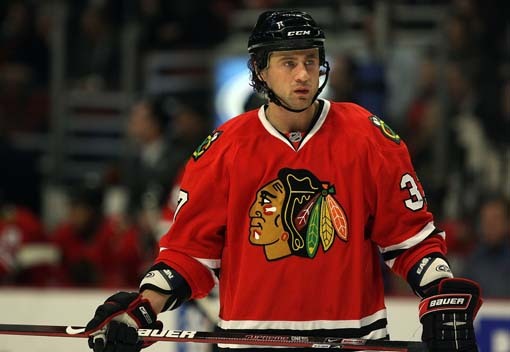 On Sunday, Sept. 20, in the second preseason game of the 2009-10 season, forward Adam Burish slid awkwardly into the boards and had to leave the game. A couple days later the team learned that Burish had torn the ACL in his right knee, and would need surgery. The injury was expected to cost Burish six months of the season. Fast forward to Wednesday afternoon, Burish’s 27th birthday. The former Wisconsin captain appeared on ESPN 1000 to talk about the Hawks recent streak of great play, and also talk about the progress of his rehab. What he told the listeners made today a happy birthday for Hawks fans. Apparently Burish has been skating on his own almost every day and plans to return to game action after the Olympics. Last year, Burish had nine points (six goals, three assists) including two game-winners in 66 games. Despite only playing an average of 9:12 per night, Burish served 93 penalty minutes as well. Another piece of good news for the Hawks came from coach Joel Quenneville after the morning skate on Tuesday, when he told the media that center Dave Bolland could return as early as a few games before the Olympics, but should certainly be available to start March.